At least 80 people were killed and over 100 were injured when an attacker driving a truck loaded with grenades and other weapons plowed through crowds in Nice, France, on Thursday night. July 14th is Bastille Day and the streets were full of revelers out in the southern coastal vacation city celebrating the French Revolution. 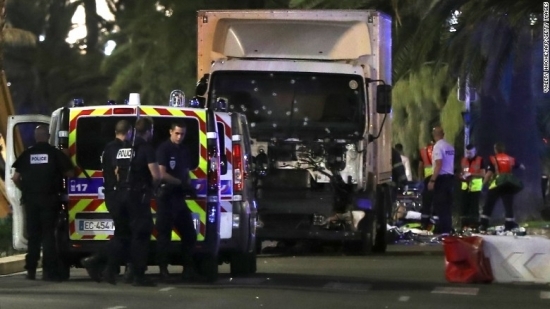 Christian Estrosi, president of the Nice region, said that the motorist "fired on the crowd" and said that "the truck was loaded with arms, loaded with grenades." He seemed to have "completely premeditated behavior," Estrosi added. The driver drove for nearly a mile down Boulevard des Anglais along the Mediterranean Sea where people had gathered to watch fireworks. The attack started just as the fireworks ended and the crowd began to disperse. There was only one person in the truck. He was shooting people at same time he was barreling them over, zigzagging his way down the street. The entire area had been blocked off to traffic because of the celebrations. He was eventually stopped by police who shot and killed him. At this point authorities do not know if the attacker had any ties to a specific terroristic organization or what the his motives were.